- Made from 3.3 borosilicate glass material, it is capable of handling even the strongest chemicals like acid. A. Made in borosilicate glass graduated 5, 10, 25, 50, 100, 250, 500, 1000, 2000 ml. B. Made in soda glass graduated 25, 50, 100, 250, 500, 1000 ml. C. Same made in neutral glass. 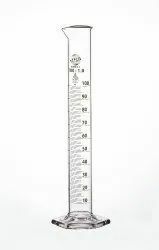 We are engaged in the manufacturing of a wide range of Measuring Cylinders in white color. Made from 3.3 borosilicate glass material, it is capable of handling even the strongest chemicals like acids. We offer these cylinders in a sleek yet sturdy design which makes them long lasting. To suit the measuring requirements of the clients, the cylinder is clearly marked by graduations. 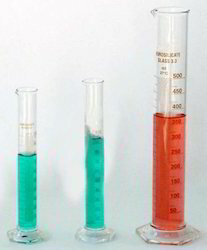 Measuring Cylinders are made from borosilicate glass, neutral glass and soda glass. It is highly accurate and opaque.